I tell a story about visiting a high end studio. The owner possessed a great mic cabinet. Yet, he seemed most proud of his AEA R84 ribbon microphones. After getting some time to review the AEA R92, I think I understand. First, AEA makes some interesting mics. Obviously, they outwardly borrow in look and feel from the RCA 77-DX in their AEA R84 and AEA R92. Yes, they got that giant pill look. You know what I mean. They look like a giant cold capsule. The AEA R92 ingeniously uses this giant pill approach and uses it to create a shockmount that connects the mic with its integrated screwmount. The shockmount attaches with bands to the top and bottom of the mic. Some words on ribbon mics... Ribbon mics feature transient response somewhere between conventional dynamic mics and condenser mics. To my ears, they seem to possess the lowest self noise of any mic design. They also feature the lowest output. In essence, you need a preamp with a lot of gain to power one up. They are quiet. They tend to provide a little bit of smoothness. Shaving the harshness off of certain sources brings out a flattering musicality. I tend to think of guitar amps and horns on this one. I got in an AEA R92 just in time to track a rootsy Rock 'n' Roll band. I wanted to track the band in a commercial studio but they did not possess the budget. So, we went mobile. I ended up tracking them with my good friend, Steve Beckett, in his circa 1920s house in his large living room with oak floors. While Steve essentially handled the day to day tracking, I determined the overall sound of the project with mic and pre selection as well as recording set up. The band wanted an old 1950s feel so I went with the let it bleed theory of recording. I walked around the day before tracking and listened to the room to find the best placement for the drums. The next day the band set up with the drummer in the middle and the guitarists on either side. I put the bassist in a different room as he played acoustic. One of the guitarists showed up at the session with an old Traynor amp. I love these amps. The old ones tend to feature a nice break point where the tube distortion kicks in. I put his amp in a chair. I placed the AEA R92 about six inches away from the amp and pointed it slightly away from the cone. 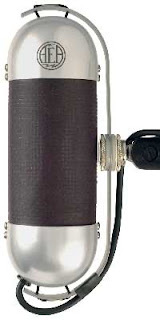 The thing about a figure eight ribbon mic such as the AEA R92 is that they pick up sound from the front and rear of the mic. However, there are these dead areas on the sides called "nulls." I made certain to line up the mic so that the drums fell right in the null. The R92 put across a good image of the Traynor amp. I particularly liked how the front side of the R92 gave me a little bit more high end than most ribbons. I thought this seemed to be just a different flavor on rhythm. However, in covering leads, I liked the agressive nature of the front side of the mic. Later, Steve Beckett and I got together and experimented a bit with the R92. It's definitely got different voicings for front and rear. While the front side tended to give a bit more high end, the rear of the mic tends to be much smoother. Steve records a lot of dialog so we tried it for dialog. Neither one of us liked it for this application. We tried it on vocals. We liked both sides but particularly lit up when we heard vocals through the back side of the mic. If I were to ever get to session with a vocalist who sings jazz standards, then I'd definitely want to start tracking through the back side of the R92. I've never been a fan of ribbon mics and acoustic guitar. However, I thought the front side of the mic put across a certain kind of "organ" sound on the acoustic that I'd like to track in the future. I did not get to use the AEA R92 over a drum kit or on acoustic bass but I am certain that with its different front and back voicings that I would not be disappointed. The Bottom Line: The AEA R92 may look like a giant pill but it'll make your ears feel plenty good. The front with its crispness offers plenty of high end detail while the rear side of the mic offers a more traditional smooth ribbon sound. It might be the best loved mic to come through for review in the history of Mojo Pie. Very highly recommended.